Habitat Byron Bay is excited to announce a new release of mixed-use Commercial Terraces are now on sale. Designed with small businesses and start-ups in mind, Habitat’s architecturally designed Commercial Terraces embrace the Live/Work concept - a private residential oasis upstairs, with flexible commercial space below. Owners have the option to convert part of the downstairs space into a second bedroom, ensuring the flexibility to meet resident’s current and future needs. The generous first floor living space is equipped with kitchen, bathroom, bedroom, laundry, spacious living area and large north-east facing deck. High and low-level louvres ensure plenty of natural light and good cross-ventilation. High quality concrete, timber and steel finishes have been used throughout to create a contemporary yet liveable environment. Residents can also enjoy the benefits of Habitat’s exclusive on-site facilities, including 25m lap pool; pocket park and recreation area; barbeques and edible gardens; ping pong tables; open green space and use of the indoor and outdoor meeting spaces within the commercial precinct. 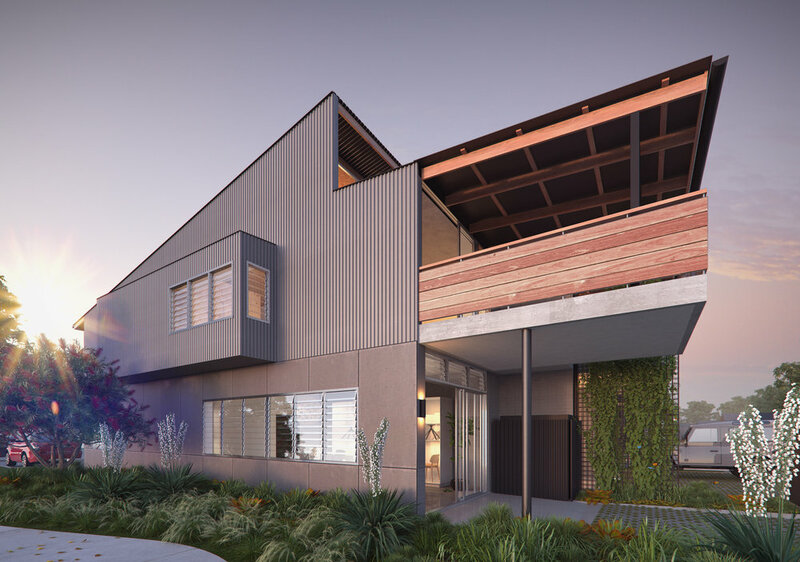 Located just off Bayshore Drive, Habitat is within walking of Byron’s thriving Arts and Industry Estate, Belongil Beach and the world’s first solar-powered train - providing direct access to Byron town centre. Habitat developer Brandon Saul explained the driving force behind Habitat as a creative and entrepreneurial hub. “Habitat is about bringing like-minded people and businesses together – progressive business people who value a sense of community that is part and parcel of the Byron lifestyle. It's for those amongst us that want to lead a more sustainable, balanced lifestyle – without having to compromise on creature comforts or style,” said Saul. “The community facilities at Habitat set it apart from everything else currently on offer in the region. Facilities including designated staff and visitor parking, electric car charging points, change facilities for those that want to ride their bike to work, top tier solar power capabilities and perhaps most importantly for this area, super-fast internet access via the NBN network,” he added. Habitat’s resident Architect Dominic Finlay-Jones of local firm DFJ Architects, shared the benefits of living and working in the Habitat community. “Habitat is a quality environment connected by creative and passionate residents and workers. Buyers who are attracted to quality design, space and landscape will be attracted to the community here,” said Finlay-Jones. “For the first seven years of my practice my office was underneath my house, so the idea of living over your workspace is very familiar to me and has become increasingly popular the world over, particularly in aiding small business to grow,” he continued. The Commercial Terraces recently won the Australian Institute of Architects’ NSW Country Division Awards for best Residential Architecture – Multiple Housing by DFJ Architects. The local firm also won the Commercial Architecture award for Habitat Commercial, the Interior Architecture award for Habitat’s renowned all-day eating establishment, Barrio Byron Bayand received a commendation in the Small Projects category for the Habitat Pool and recreation area. The new release of Live/Work Commercial Terraces are for sale now through Precise Property and Byron Bay Property Sales. Contact Kris Alcoriza, Precise Property on 02 6694 3244 or k.alcoriza@precise.property OR Brad Cranfield, Byron Bay Property Sales on 02 6685 8575 or 0401 823 310.